Mount Shasta from the Observation Deck on the Castle Dome Trail. Winter snows deprive hikers of the alpine scenery they crave and force them to find more creative alternatives in order to hit the trail. Spring, on the other hand, is the perfect time to hike the trails in the Castle Crags, one of Northern California’s most stunning features. The Castle Crags are most often viewed while driving north on Interstate 5. Since leaving Redding, the freeway passes through seemingly unending forestland as it winds first around Shasta Lake and then up the canyon of the Upper Sacramento River. Eventually I-5 rounds a bend and suddenly the Crags present themselves. The soaring granite spires, too numerous to count, huddle together to form a massive rampart towering thousands of feet above the highway. Then, nearly as suddenly the freeway rounds another bend and the Castle Crags disappear, to appear only in tantalizingly brief moments before reaching Dunsmuir. With the sole exception of majestic Mount Shasta, the Castle Crags are the most recognizable landmark in California north of Redding. Their rugged towers seem to be alone amidst a sea of densely forested ridges and they beckon hikers and adventurers to explore them. Granite towers of the Castle Crags. Spring is the best time to hike the Castle Crags because, despite their alpine appearance, they are very low elevation mountains. The highest point in the crags barely exceeds 6,000 feet and this highest point accessible by a maintained trail is only 4,700. Consequently, while the high country is still snowbound in spring, the trails in the Castle Crags are usually clear, the creeks are running strong and the leaves are beginning to come out. Most importantly, the temperatures are typically pleasant. The lower elevation means that in the summer the temperatures can be hot and are often too much so for comfortable hiking. Of course, if should be noted that autumn also has great weather for hiking in the Castle Crags but by then the creeks have usually dried up. The Castle Crags are administered by two separate agencies. Most of the territory is controlled by the Shasta-Trinity National Forest which has designated the area as the Castle Crags Wilderness. This means that the area is set aside as a wild preserve and only primitive recreation (hiking, horseback riding, rock climbing) is permitted within its boundaries. A smaller section of the Crags is run by Castle Crags State Park. Unfortunately, the park contains almost none of the granite spires that draw people to the Crags. Instead, the park functions as a gatekeeper, extracting an entrance fee in order for people to hike through state land to access the national forest. Racing waters of Burstarse Creek. There are several trails in the Castle Crags that offer great springtime destinations. The most well-known is the Castle Dome Trail. If the desire is to climb (steeply!) into the high granite reaches of the Crags, this is the trail to hike. 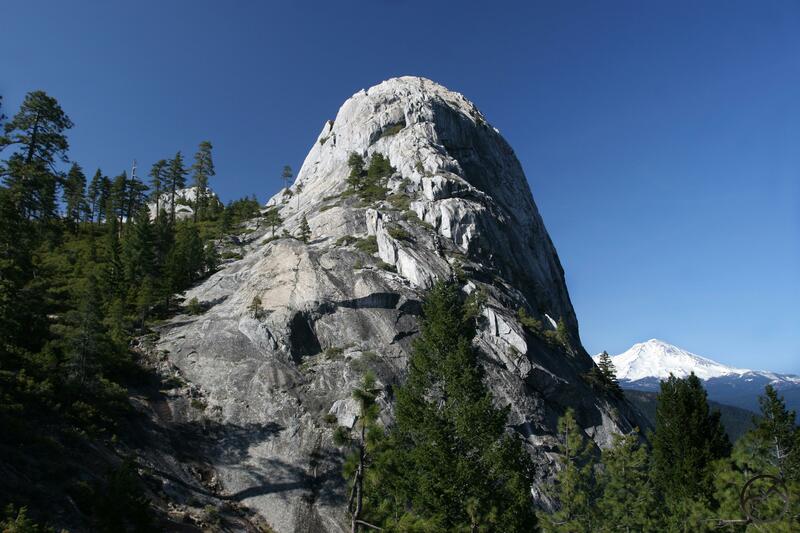 Although the views are not great for the first two thirds of the hike, the latter third is exceptionally scenic, offering great views of the Grey Rocks, Castle Dome, the Castle Crags and Mount Shasta. It also provides an opportunity to do some exploring in the granite spire-filled hinterland. 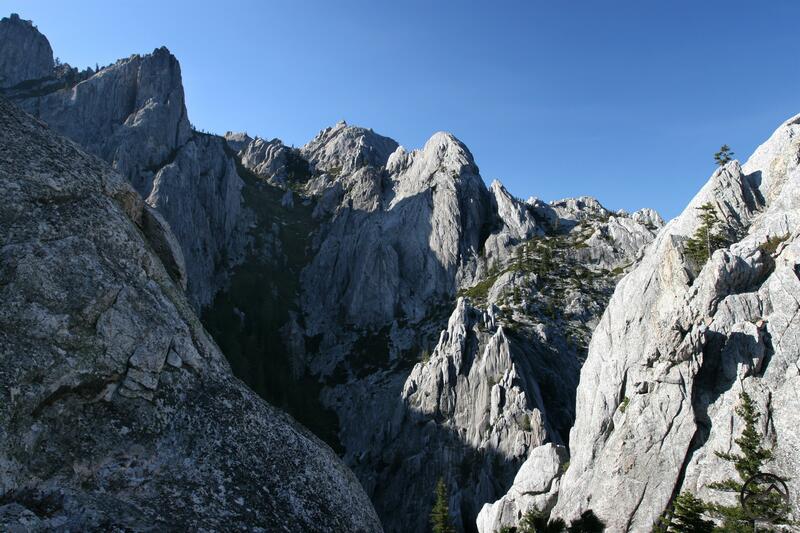 Although the Castle Dome Trail is the most popular hike in the Castle Crags it is not the most well known. 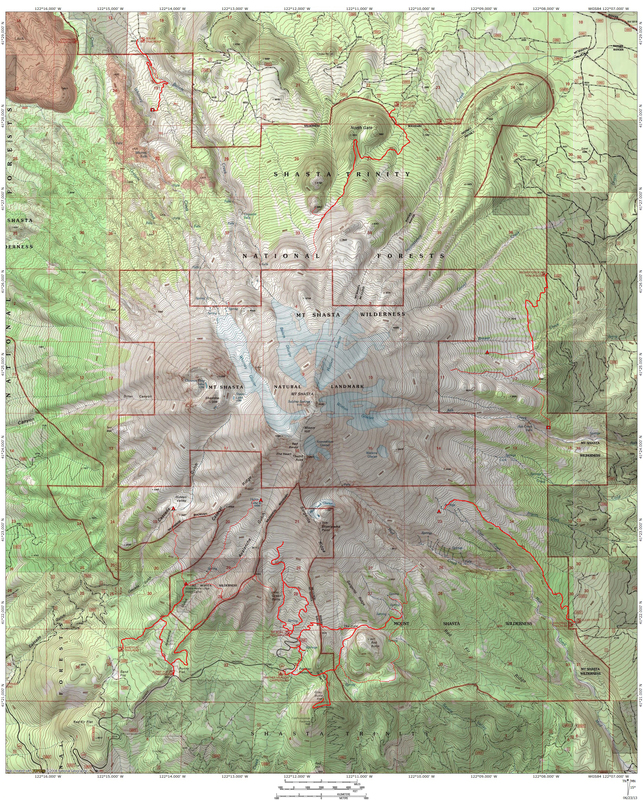 The Pacific Crest Trail completely traverses the southern side of the Crags, totaling 12.5 miles. Most of this trail is of interest to hikers, especially in the spring. 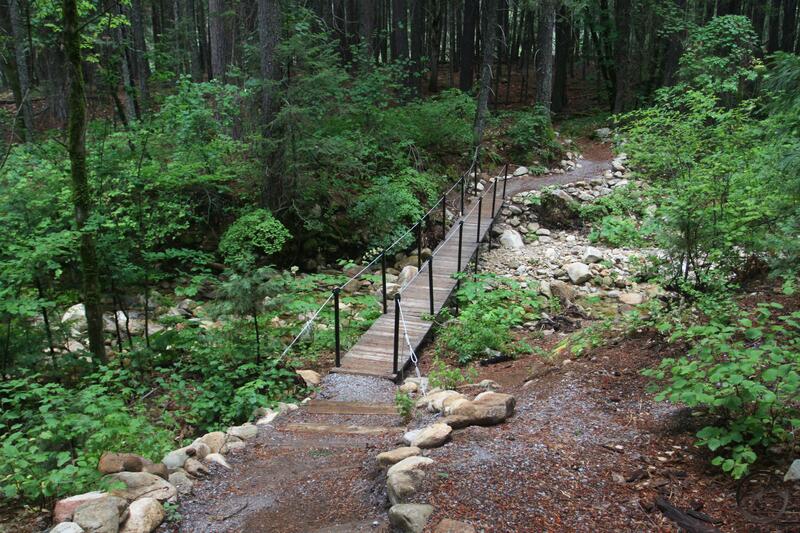 A great 2.5 mile stretch of the trail heading east leads to a cross country route accessing Burstarse Falls. The easternmost 6.75 miles is also a great spring hike and boasts great views of the Crags and the jagged Grey Rocks as well as several attractive creeks that have excellent flow in the spring. The Root Creek Trail, on the east side of the Castle Crags leads to Root Creek. There is a cross country route up the creek to a vista below awesome Root Creek Falls. Easily the most popular trail in the Castle Crags, the Castle Dome Trail is the only trail that delivers an intimate exposure to the spectacular scenery Crags have to offer. Climbing through the forested ridges below the granite spires, the trail is at first a monotonous slog with little in the way of scenery. Eventually the effort pays off as the path breaks out of the woods and offers amazing views of the surrounding area, most notably the Castle Creek drainage, the Grey Rocks and the granite walls of Six-Toe Rock. A side trip to Indian Spring is a well-watered and relaxing oasis. From this point on, the trail is a scenic and exciting ascent through rocky pinnacles and along narrow cliffs. Along the way there are more views, this time of Castle Dome and awesome Mount Shasta. When the route finally reaches the saddle slung between the main body of the Castle Crags and Castle Dome, there are a few different options. 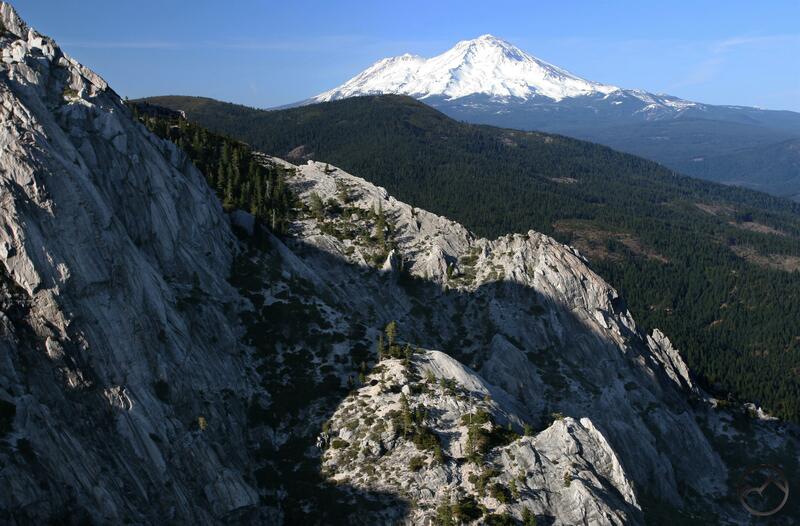 Besides attempting to reach the summit of Castle Dome, hikers can climb atop the Observation Deck, which offers amazing views of Mount Shasta, peer down into the depths of Root Creek Canyon or scramble to the base of sheer Mount Hubris. Whatever the decision, this is as close as most people get to the towering granite splendor of the Castle Crags. Spring is the ideal time to do this hike. Though the forest cover provides ample shade this trail is low enough that is can get very hot during the summer. The lack of shade on the saddle is also notable. During spring, the temperatures are comfortable and the weather is generally pleasant. Although the PCT traverses over 12 miles of the lower flanks of the Castle Crags, little of it offers taps the scenic potential the Crags offer. Much of it is through the thick forest that cloaks the feet of the mighty towers. There are occasional glimpses of the spires but hiking most of it with the expectation of experiencing the majesty of these mountains. Only the highest portion of the trail’s passage through the Castle Crags reveals the kind of views one might anticipate. Still, there is one section of the PCT, accessed by the short Dog Trail, that is a worthy day hiking, culminating with a scramble through the beautiful canyon of Burstarse Creek. Here the granite finally makes an appearance. The creek swiftly descends a series of rocky sluices and over several beautiful cataracts. 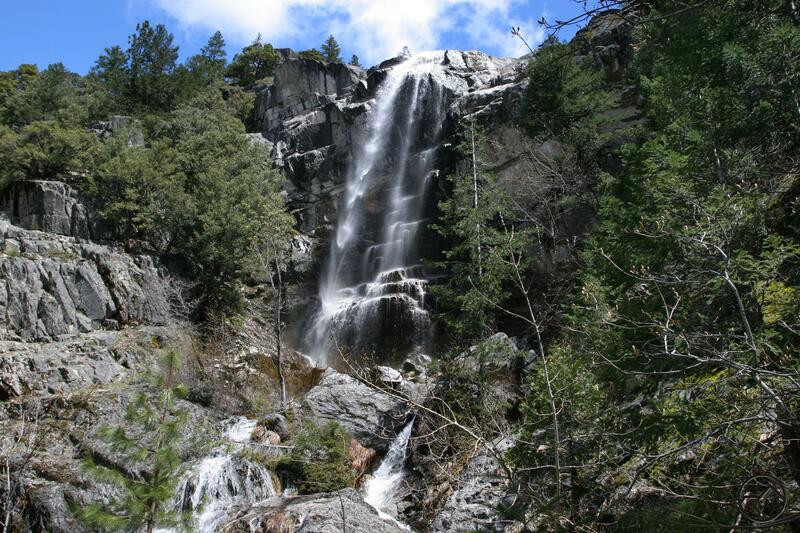 At the head of the canyon is Burstarse Falls, one of the finer waterfalls in the Mount Shasta area. 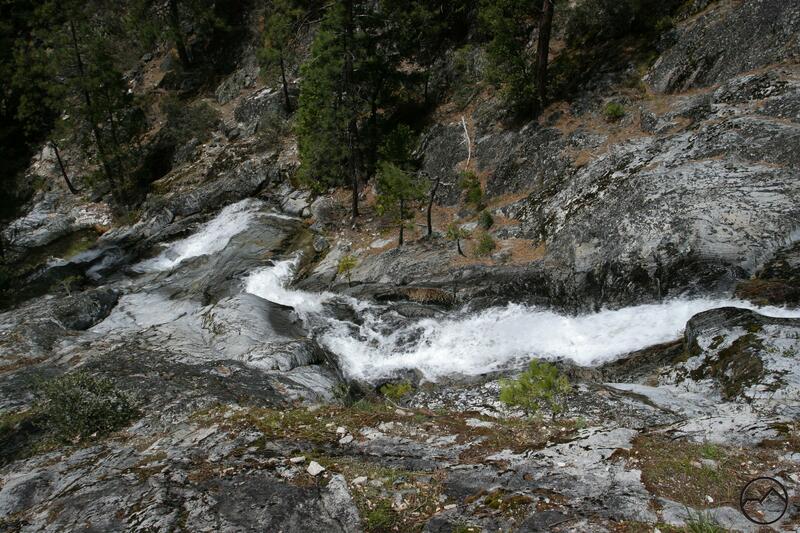 Spring is ideal for this hike since the water in Burstarse Creek will be at full flow. Later in the year the volume subsides significantly. This trail is also free of snow fairly early. Battle Mountain towers above the PCT. 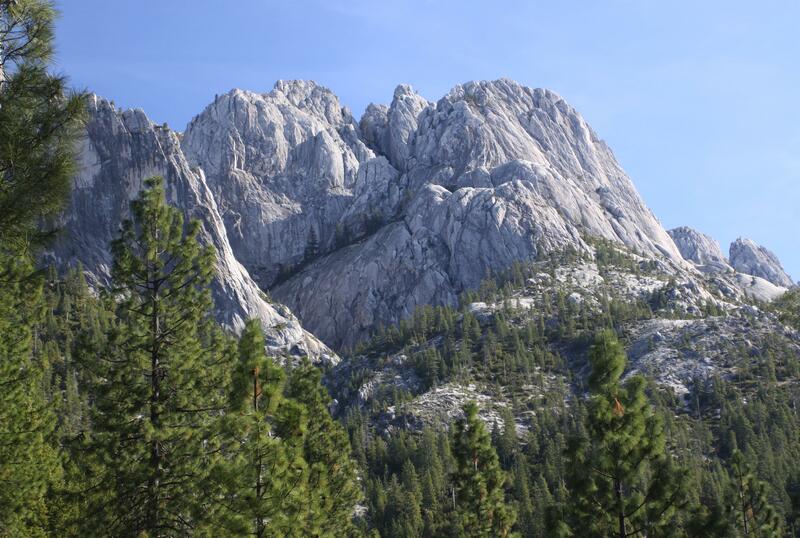 The eastern section of the Pacific Crest Trail’s traverse of the Castle Crags makes a great shuttle hike. Also accessed via the Dog Trail, the long traverse passes through lower mountain forests that are a mix of pine, fir and oak. Thankfully it is not just a trip through the forest since frequent open areas provide amazing views of the Castle Crags, specifically the Battle Mountain towers. There are also tremendous views of the Castle Creek valley crowned by the rugged peaks known as the Grey Rocks. Crossings of two forks of Indian Creek, Dump Creek and multiple forks of Indian Creek also make for refreshing and scenic hiking. Though this section of the PCT is not known for waterfalls, most of the creeks have very pleasant cataracts on them. A full traverse of this section of the trail normally ends at the Soda Creek trailhead at I-5. 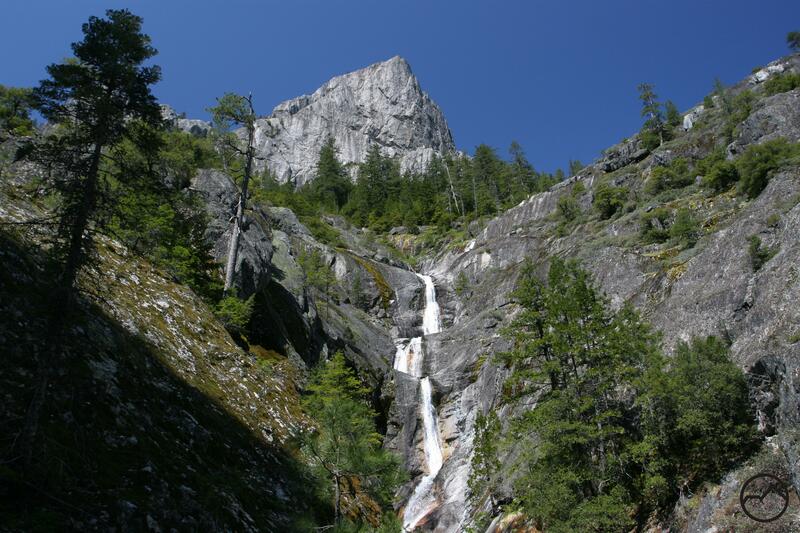 However, junctions with the Flume Trail, Bob’s Hat Trail, Castle Dome Trail, Root Creek Trail and Kettlebelly Ridge Trail all lead back to trailheads in Castle Crags State Park, which give campers at that park multiple options to modify the journey. For hikers not able to shuttle, the hike to Indian Creek is still a great option for an out and back via the Dog Trail. This trail is something of a mixed bag. While not steep, the trail is extremely monotonous for all but the very end of the hike. It is essential a romp through seemingly unending forest. This may in fact be just the ticket for those who have been housebound for much of the winter. Just stretching the legs in the woods can be a great warm-up for better things to come as the season progresses. This may especially be the case because this trail has the easiest access and the lowest elevation of all the paths in the Castle Crags. The trailhead is right at the exit off of I-5, so there is no need to wait for roads to be cleared to reach this hike. What is the payoff for the not-so-exciting trail? Root Creek Falls is the reward for making the trek to the end of the trail. When the path ends at Root Creek, there is a short cross country scramble to a view of the awesome waterfall. The multi-tiered cascade is best viewed in spring when the water levels are high. Towering overhead is the smooth granite tower of Castle Dome. The scene is incredible and the perfect cure to the winter doldrums. One of the easier hikes in the Castle Crags, this trail travels along the lowest reaches of the Crags. It begins on the Indian Creek Nature Trail, crosses the eponymously named creek before reaching a junction at the proper beginning of the Flume Trail. At this point, the path follows the route of a 19th century flume, the remnants of which are still visible in many places. The trail passes beautiful forests, a primitive campground and expansive groves of oaks. The latter part of the trail combines with a short section of the Pacific Crest Trail to form a nice loop. This part of the hike is highlighted by the crossing over Dump Creek, some spectacular views of the Castle Crags and a dramatic overlook where most of Castle Creek’s watershed is revealed. On the return, the junction with the Indian Creek Nature Trail includes the option to return via the second half of that trail’s short loop. This includes another crossing of the lovely creek amidst granite boulders. This is a great place to relax and put your feet in the water. Awesome post. I finally had time to stop there last spring and had a great time hiking.